I don't like to throw away food. I often come home with half-eaten pieces of fruit in the handbag, after a long afternoon on the playground or in the park with the kids. What better to do with it than making muffins out of it, for next day's breakfast. 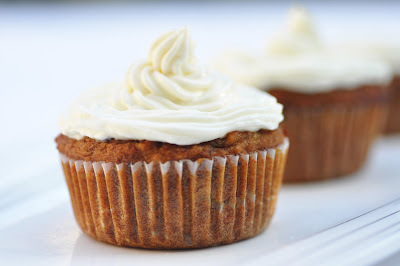 These apple banana muffins are perfect for my playground leftovers. They are a very flavorful match. The muffins are packed with fruit, just little added oil, and with agave as natural sweetener. They come out very moist. Without the frosting they are even vegan. Delicious and healthy! Preheat oven to 180C. Line a muffin tin with liners or coat with cooking spray. In a bowl, combine flour, salt, baking soda, cinnamon and nutmeg. Mix well. In another bowl, combine canola oil, agave, vanilla and mashed bananas. Combine wet ingredients with dry ingredients. Stir in the apple. Spoon the batter into the muffin tins. Bake for 20 to 25 minutes, or until toothpick comes out clean. Let cool completely. Combine agave and cream cheese and drizzle over the muffins. Let the frosting become solid before serving.